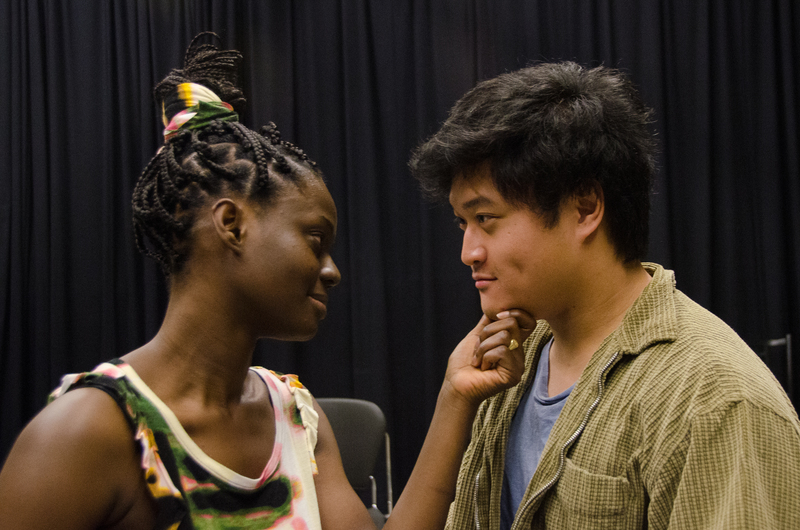 Akua Konadu as Naja counsels Richard Lee as Anon in “Anon(ymous)”, Toy Boat Theatre at UW Tacoma. Photo by Peter Serko. 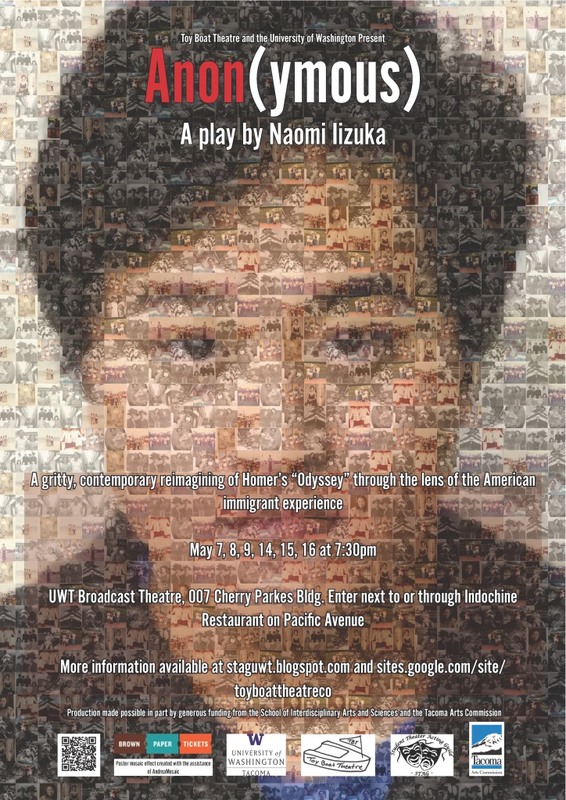 Tacoma’s Toy Boat Theatre is partnering with the University of Washington Tacoma to produce Naomi Iizuka’s 2006 play Anon(ymous) on the UWT campus this May. Based upon Homer’s epic The Odyssey, Anon(ymous) is a beautiful, gritty, very contemporary re-telling of the “hero’s journey”, exploring themes of immigration, interculturalism, poverty, violence, family, and the meaning of home. 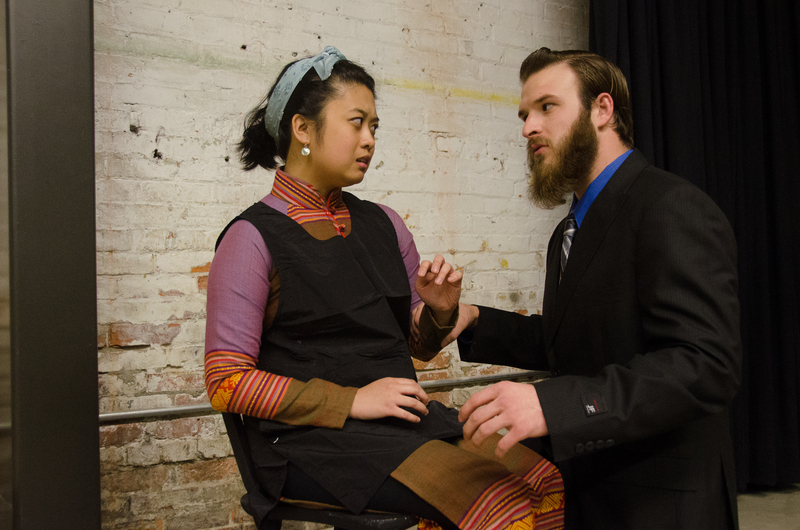 Centering on the memories of a nameless and homeless orphan who searches for his mother and a place to belong, the play takes audiences on a surreal journey filled with compelling characters. Jillian Lee as Nemasani is bullied by her employer, Yuri Mackus, played by Claymore MacTarnaghan. Photo by Peter Serko. Toy Boat Theatre and UWT aim to create more seasonal offerings such as Anon(ymous) that reflect the make-up of our community, particularly the sizable underserved populations in the area. The vision for this project is that it may serve as the first step toward creating a new university/community collaboration model of theatre. Directed by Marilyn Bennett, who has taught, directed and acted in the region for over a decade, the cast and production team are a healthy mix of UWT students and area artists. The production team includes: Michael Kula, UWT advisor/liaison; Ashley Jackson, stage manager; Ricky German, costume design; Jens Winship, sound design; Nick Spencer, dramaturge; Emily Cohen, fight choreography; Peter Serko, photography; and Erin Chanfrau, design consultant. Tickets: $10 general audience, free for UWT students, $5 for students from other institutions. Free preview performance on May 7. Pay-what-you-can admission on May 14. Tickets available online at Brown Paper Tickets. Anon(ymous) is suited for audiences from 5th grade through adult. The Tacoma Arts Commission is proud to support this production through Arts Projects funding. 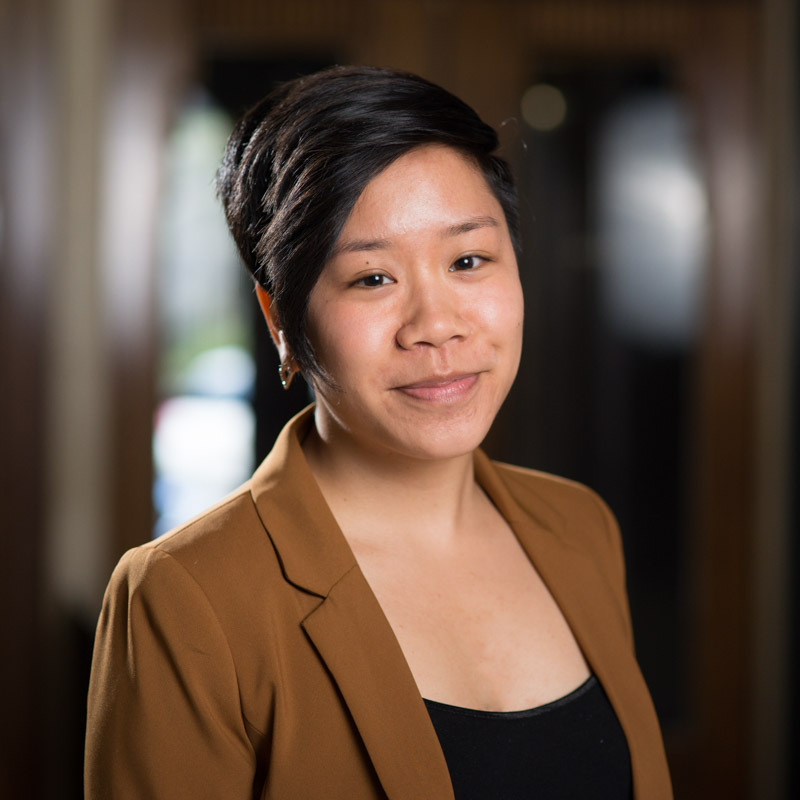 The Tacoma Arts Commission is pleased to announce the selection of Cathy Nguyen as Tacoma’s 2015-2017 Poet Laureate. Over the next two years, Nguyen will participate in and host public poetry readings, workshops and other community events. She will also participate in Tacoma Arts Month each October, and help produce the 2017 Tacoma Poet Laureate Ceremony to announce the next Poet Laureate. As a wrap-up of National Poetry Month, the Tacoma Arts Commission and Tacoma’s current Poet Laureate, Lucas Smiraldo, will host a poetry and music event at which Nguyen will officially be awarded the title. The free, public event will be held Friday, May 1, from 6 – 8:30 p. m. at B Sharp Coffee House (706 Court C in downtown Tacoma). Featured poets will include Nguyen, Smiraldo, 2011-2013 Tacoma Poet Laureate Josie Emmons Turner, 2010-2011 Tacoma Poet Laureate Tammy Robacker, 2009-2010 Tacoma Poet Laureate Antonio Edwards, Jr., and 2008-2009 Tacoma Poet Laureate William Kupinse. These poets and others will be joined by musicians Terry O’Hara and Bronson Bragg, vocalist Kathryn Burke, and there will be music compositions by Gregory Youtz. Cathy Nguyen is an “artivist” who seeks to promote social equity and youth leadership through creative expression and community organization. A resident of Tacoma since 2010, Nguyen has worked to infuse the arts in a variety of human service and grassroots contexts. In 2012, Nguyen created and coordinated “The RIOT”, a first-ever teen poetry/hip-hop program at STAR Center. In the years that followed, Nguyen worked to draw on and capture the voices of queer youth and young adults through a variety of arts, violence prevention, and leadership development programming at Oasis Youth Center. Currently, Nguyen integrates creative expression with youth and community development as a teen support group facilitator at BRIDGES, a center for grieving youth and their families, and as an organizer of Tacoma Stands Up, a grassroots initiative calling for an end to police brutality and social injustice through peaceful organization, where she has led Tacoma-wide rallies and arts events focused on community-building and social justice advocacy.